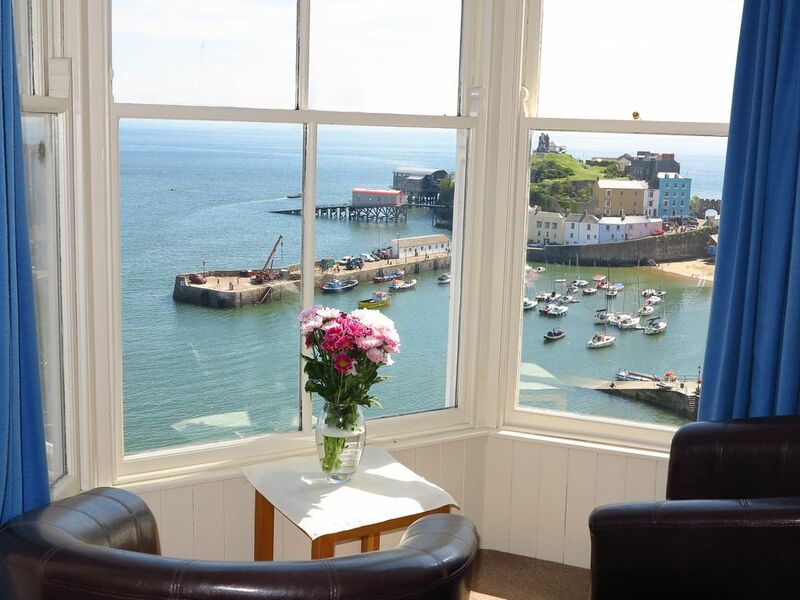 Third floor, purpose built apartment, on cliff top overlooking north bay and Tenby harbour, with stunning panoramic views. Central high street location. Overlooking Tenby Harbour Beach which was voted "BEST BEACH IN EUROPE" by European Best Destinations. Lounge Bay Window has probably the best view in Tenby. Very quiet bedroom at rear of the property with large bathroom. All electric kitchen. Combination storage heaters. I was born and live in the town of Tenby, Photographer, sailor with past career in hotel management, marine and the offshore oil/gas industry. A member of the local harbour community and sailing club. A walker and boat angler. I am always available to help in any way to ensure you have a nice holiday. My hotel management experience makes me understand how important customer enjoyment is, and I aim to provide a good service. The central location, fabulous view, purpose built with full safety requirements. Designed for two persons only, to ensure comfort and privacy. Relax in the new king size double bed or enjoy just sitting in the bay window watching the world go by. See the boats coming and going from the harbour with the ever changing tide. The High Street with sea view makes for the perfect location with everything you need close at hand. A stone's throw from the beach and a short level stroll to the shops and amenities. Security coded digital entry system through main front door. Available nearby at Multi story cctv monitored car park with lift. Current charge £20.00 per week with multi-access too all PCC car parks on the same ticket. Excellent secure facility. Wi-Fi Tenby provided free by the local council available in the apartment and all over town and beaches. There is 4G coverage in the apartment for mobile telephone. with electric cooker, hob and oven, microwave, fridge with freezer compartment. Built in storage units and worktops. Single drainer sink. Well equiped with plenty of working space. Tenby (Links) is the oldest affiliated golf course in Wales and is ranked in the top five in Wales. Notes on accommodation: Strictly: No Smoking or Pets and 2 persons maximum. Heating/electricity included in price. Parking, several choices including the pay and display public car parks with a daily charge of £2.00. Tenby (within the town walls) is pedestrianised between 11am and 5.30pm daily during the main school holidays in the summer. Arrival from 2 pm. Departure 10am. Cleaning / Towels / Linen / Maid service: Bedlinen, pillows (2 per person)and duvet, bath mats and Tea-towels are provided. The property is cleaned prior to changeover (Saturday) In order to reduce costs we ask you to bring your own towels. Other: Hallway with clothes hooks and shoe rack. We met Darell at 2pm as arranged, he took us up to the apartment and went through everything with us, it is clean, and comfortable, and the view is amazing. Darell is a really nice man, and lives a short distance away if you have any problems. Glad to say we didn’t.! Nice location with a lovely view. Will book again. Darrel communicated well with us prior to our arrival and gave us thorough and easy directions. Very nice to be welcomed to his home and shown around. He explained how to find places, where to park, things to do. The location of the flat is amazing. You can sit in the window and the time passes by so easily. Beautiful views over the beach and harbour. There is so much to do in and around Tenby. Such a beautiful coastline and great walking. Super restaurants and good local beer! Not enough time and so much to see and do. We will have to come back! Thank you Darrel for your kind hospitality. This is a great place to stay with fantastic views. Everything is just as described. The kitchen is well equipped and has a brand new cooker. The lounge/ dining room is spacious and comfortable and the bay window is the perfect place to sit and watch the tide ebb and flow. Just a couple of minutes walk in to town or to the beach and harbour., with lots of pubs and restaurants to choose from. Darrell met us at the property and gave us a comprehensive guide to the flat and its contents. No parking at the flat but we parked on street about 5 mins walk away and there are several nearby car parks with reasonable long stay rates. Despite being on the main road and surrounded by buildings at the back, the only real noise came form the local seagull population. We thoroughly enjoyed our stay and would happily return as Tenby is one of our favourite places and this flat is an excellent base from which to enjoy it. Lovely view, warm welcome by owner who showed us round. Clean and well presented flat with a new cooker, ideally situated for town. Lovely places to eat and shop. If you are going to stop here travel light. Need to be active as there are 48 steps to walk up and down to the flat. Arranged to leave at 10am after being asked twice by the owner. At 9.45 owner was in passage way waiting for us to leave. Cleaner arrived at 9.55 and they both went in the flat. Sorry Darrell but this was rude. It clearly states on the website that the property is on the 3rd floor of the building and there is no lift. My arrival at 0945 was to say good by and to enquire if everything was fine with the clients visit. Being polite has been mistaken for rudeness. I always meet and greet my clients and try to say good by and check that their visit was enjoyable and that there are no problems with the apartment. I have 8 repeat bookings already for this year, and have clients that have been returning for 5 years. I am one of very few owners that meet and greet all my clients, most properties in the town are key safe entry and you never see anyone. I am also available to help and assist with any problem that my clients have during their stay and ensure that they have my mobile number. I suppose " You can please some of the people some of the time but not all of the people all of the time"
The monastic Island of Caldey is 20 minutes boat journey from Tenby Harbour. Tenby is the host to the Iron Man Wales triathlon event which takes place on 16th September 2012. Boat angling can be arranged with the owner. North Beach is right in front of the property with Tenby Harbour 1 minute walking distance. Tenby has five award winning blue flag beaches and two nearby Islands. 2 Hours from the Seven (M4) bridges, 3 miles from Saundersfoot, 4 miles from Manorbier with it's beach. The Pembrokeshire cliff path passes the front door. 1 hour from the cathedral town of St. David's which is the smallest city in Britain. 20 minutes from Stackpole and Bosherston Lakes a lovely estate managed by the National Trust. Tenby has both rail and coach links to all major destinations and airports. A Tesco Express (open 6am to 10pm 7 days per week) is 2 minute walk. Sainsbury's supermarket is 3 minute walk. All restaurants, Pubs, banks and shops are within a 3 minute walk. Tenby is a great location to explore Pembrokeshires natural beauty, a walker's and nature lover's paradise. The offshore Islands of Skomer, Skokholm and Caldey Island are well worth a visit to see the beautiful sea birds and seals. There are many varied boat trips available to explore the beautiful coastline and visit the Islands. The local bus company has a coastal bus service to visit the various bays including the world famous 'Barafundel Bay' which was voted by 'National Geographic Magazine' as the second most beautiful beach in the world!.